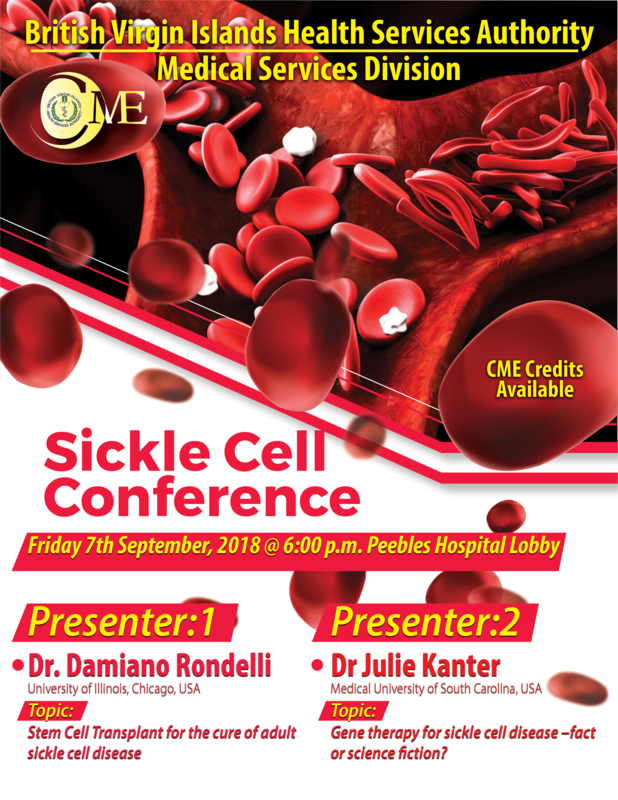 A Sickle Cell Conference will be held on Friday September 7 to share the latest information on revolutionary treatments for the disease. The conference is an initiative by the BVI Health Services Authority through its Medical Services Department. Dr. Samuel said it is an opportunity to learn about new treatments for Sickle Cell Disease, studies in Stem Cell Transplantation for adult patients with Hematologic Malignancies and for Sickle Cell Anemia and Clinical Trials of Gene Therapy and its impact on reversing Sickle Cell Disease. Presenters, Doctors Damiano Rondelli, Julie Kanter, and Erole McLean Hobdy from the USA and USVI, are experts working in this field of healthcare. Medical Doctor and one of the organisers of the event, Dr. Elizabeth dos Santos said that the conference will bring renowned experts in the field to discuss cutting edge treatments for patients with Sickle Cell. Sickle Cell is an inherited form of anemia that presents at birth. It is a condition in which there are not enough healthy red blood cells to carry adequate oxygen throughout the body and can result in painful crisis as well as several other debilitating complications. The disease affects one in 500 black persons, one in 36,000 hispanics and is a life-long disease that has an enormous impact on quality of life of the patient and the family who care for them. People who have inherited one Sickle Cell gene and one normal gene have the Sickle Cell trait. This means the person would not have the disease, but will be a trait “carrier” and can pass it on to his or her children. The conference will be held in the Lobby of the New Peebles Hospital from 6:00 p.m. to 8:30 p.m. and is open to the public and, particularly parents and families who have the disease. The BVI Health Services Authority is committed to delivering excellent, compassionate, client centered healthcare across the Territory.